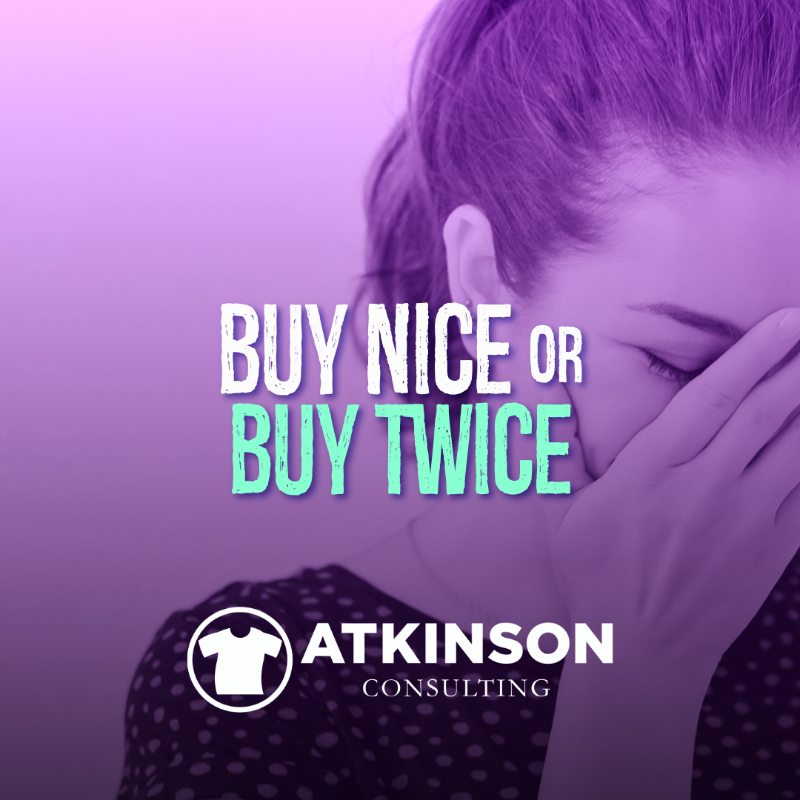 “Buy nice or buy twice”. Have you heard that axiom before? I’ve spent a lot of time with shop owners over the years, and one thing I’ve learned is that some are super cheap when it comes to outfitting their shop, but others always seem to buy the right tools for the job. Instead, you see these same folks struggling. So instead of having anybody in the company use a system and mix a perfect Pantone match in about four minutes, they will gladly have Fred (the one with the good color eyeball) spend an hour and Frankenstein some color together for the job. Reorder next year and need to mix some more of that same color? Good luck. Uh, no. That just makes the print thicker. I never understood the mentality of printing multiple print-passes instead of using the industry-standard formulated ink, printed correctly. Nothing against that massively huge country, but not all products made there are the same as the industrial grade items that most everyone uses. Sure you can save some cash by using that weird China-made flash unit or press. Maybe even those “recycled” t-shirts that come individually polybagged, and are delivered in the always crushed 1 mil thick cardboard box. But you know in your gut that these are going to be a problem even before you click the button to order them. Feeling brave? Post your horror story in the comment section below. I’ll understand if you don’t. There is something to be said about being reliable and safe. What we want to focus on in our shops more than anything is performance. Ignore what something costs for a minute. Does it actually do the job? Does your emulsion remover reclaim the screen without ghosting or excessive scrubbing? When you try to use tape in your shop, does it easily peel off of the roll and stay in one piece? Does it leave a residue on the screen? Can you use ink right out of the bucket or do you need to doctor it up to be able to print with it? My favorite story about this was with an accountant in a shop. It was insisted to use a particular shrink wrap for skids because it was the cheapest they made. But in order to adequately secure the boxes to the skid, the load had to be basically mummified with three layers of wrap. Instead, we sourced a new shrink wrap that was stretchy and stronger. Sure it cost a little more, but you only had to go around the skid once. This was a 2/3 reduction in the amount of shrink wrap used, not to mention having the shipping clerk less dizzy from wrapping the skid. Let’s say you want to get your webpage redesigned and you need to outsource that task. There are two companies to evaluate. One has decades of experience and has built hundreds for small businesses just like yours. They have a proven track record, and you even know the people they feature in their testimonials. The other is over 50% cheaper, doesn’t quite have the experience and wants to “give it a shot”. While plenty of people might go with the more experienced developer, you know there is a crazy huge amount of folks in this industry that would always choose the cheaper route. You’ve seen their websites too, I’ll bet. Saving cash on things that you don’t use all that often is one thing. But for “it-must-work-perfectly-or-we-are-doomed” things for your business, it might not be the best option. Your website. The machines you use to decorate the garments. Items that are constantly in use. These are the items that you need to buy the best that you can afford. 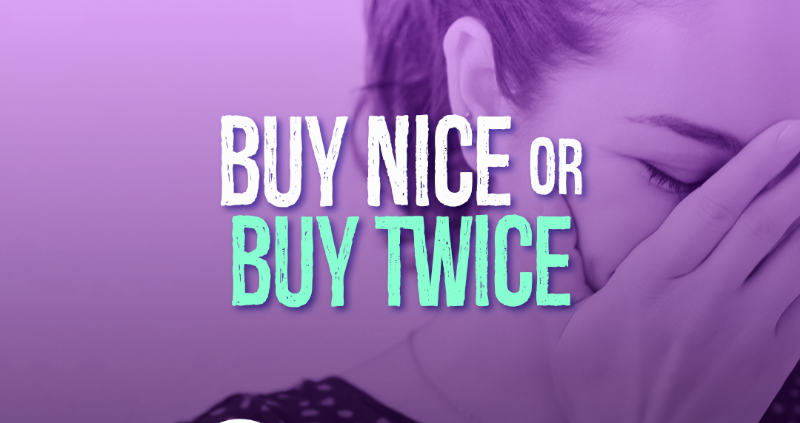 Sometimes you have to look deeper before you make a buying decision. These ideas won’t be written on the box, or maybe even on a website. Does the company have a good reputation in the industry? Ask on a Facebook or Industry forum to get a good reaction. In about thirteen seconds after you post, you’ll know. What about a warranty? Do they back up their products or service? Do they have a helpline, technical assistance, or customer service staff that is easy to access? Try calling before you buy. How well stocked are they with replacement parts? Easy to order? On a website that you can look up yourself? Do they have a pre-order checklist on things you might need? This is especially helpful with equipment purchases for electricity, floor space, and other things. Sometimes there is nothing wrong with buying used. Can you find what you need, but at a discounted price? Has it been refurbished? If you are buying equipment for a new decoration method you don’t currently offer, do you have a sales plan on filling orders to pay for the machine? Can you get some training to use the product, machine, or software? Does it come free with purchase? Name anything. There is a cheaper version. Baked inside is a host of problems. Shortcuts on the design, materials, or ingredients. No warranty. Zero training or support. Inconsistent manufacturing. Think car parts. Toilet paper. Hotel rooms. Hamburgers. Car tires. Even cheese. The good things cost a little more. That’s why I believe things should be evaluated on performance. Can you name a few examples in your head of something you bought for your shop, and in a short period of time you had to replace it? Do you sell Athletic apparel? Are you hitting constant home runs with your sales and marketing efforts? Want to learn from the best industry pros and develop a new strategy that actually works? Then Shirt Lab Washington DC is for you. 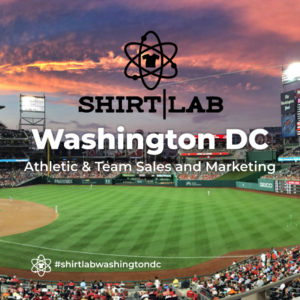 Not only is it built for Athletic and Team Sales and Marketing, but we’re actually having it in the Reagan Room of the Washington Nationals stadium. Plus, every attendee after the event on Saturday will get to stay and hang out with us as we watch the Washington Nationals play the Chicago Cubs. This Shirt Lab is all about sports. Whether you are catering to team sports like soccer or little league, cross fit gyms, or 5k race, as you know, this is a niche all it’s own. That’s why we are bringing the heat for this special event that is built to make you better. This event is about you winning. Let us help you develop the tools and strategy you need.